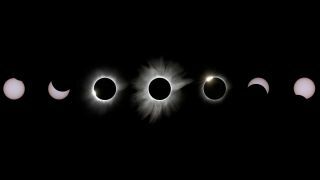 Justin Ng led a group of eight first-time eclipse photographers when he captured the images for this eclipse collage early on March 9 in Palu, Indonesia. He took the photos with a Canon 7D at 400mm with a DIY solar filter. If you long to see the Earth from an astronaut's perspective, explore the wonders of the cosmos, delve into space history or capture your own vivid views of the sky, a book about space photography could hold just the picture. Here are Space.com writers' and editors' picks for photo collections and astrophotography books that will transport you to other worlds. Kelly guides Space.com through some of his favorite photos and talks about the book here; look through a short gallery of photo picks here. British astronaut Tim Peake's photo book takes its name from an unusual moment during his six months on the International Space Station — he tried to call his family on Christmas Eve in 2015, but dialed the wrong number instead, confusing the answerer with an unusual greeting: "Hello, is this Planet Earth?" Read more about the book here, and see a gallery of some of the book's images here. NASA astronaut Don Pettit's stunning space photographs fill the pages of "Spaceborne," a glossy photo collection that spotlights the ever-changing Earth, streaking stars and the details of the International Space Station. Over the course of Pettit's three space missions, he captured hundreds of thousands of photographs documenting an astronaut's view — and the best of them are collected here. Read Space.com's Q&A with Pettit on space photography here, and see a gallery of "Spaceborne" images here. "Abandoned in Place: Preserving America's Space History" by Roland Miller. Read more about the book and see its haunting images here, and read an op-ed by the author here. "Infinite Worlds" by Michael Soluri. Packed from cover to cover with stunning images taken on the ground and in space, "Infinite Worlds" tells the story of STS-125, the last crewed mission to repair the Hubble Space Telescope. Photographer Michael Soluri was granted nearly unrestricted access to the mission program leading up to the launch, and the behind-the-scenes images will thrill NASA fans. These masterful photographs capture the bare reality of preparing for a crewed space mission. The book's text includes essays by the astronauts and other mission staff. It also features images taken by the crew during the mission, and of course, images by the Hubble telescope. This is a fantastic addition to any spaceflight book collection. You can see photos from "Infinite Worlds" here or watch a video of Soluri discussing the book and Hubble. Chris Hadfield made a name for himself on social media during his five-month stay on the International Space Station in 2012-2013 by tweeting from space, recording humorous videos and even playing guitar. The Canadian astronaut, like most visitors to the space station, also took innumerable photos looking back down at Earth. Watch a video interview with Hadfield about the book here. "Planetfall: New Solar system Visions" is an oversized tome filled with page after page of alien landscapes — its pages tour Earth, the moon, the sun, Mars, Jupiter, Saturn and the asteroids and comets that inhabit our solar system. Author Michael Benson, who published two previous books of celestial images, created the images by processing raw spacecraft data to reproduce what the human eye would see from each viewpoint in space. Read a Q&A with author Michael Benson here. We're adding to these lists all the time; let us know your favorites in the comments below!